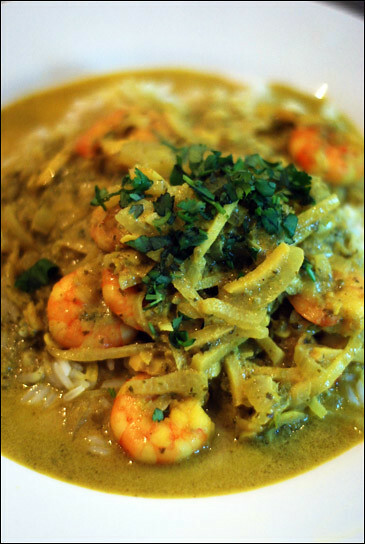 Having emptied out the fridge and freezer before going to Ireland and coming home to find we had little more than some coconut milk, frozen king prawns, an onion and some garlic in stock, my other half suggested making a prawn curry. Which I then took to be a challenge to do just that. On top of what we had in stock, I purchased some ginger, green chillis, fresh coriander and a lime. I think next time I’ll tweak the recipe a bit by setting aside half the sliced chillis and adding them to the onions, ginger and garlic; and also throwing some soaked red lentils into the mix. The ingredients list may look quite long, but it's very simple to put together. I found it surprisingly mild considering the amount of chilli in the sauce, but the combination of coriander, chilli and coconut milk is wonderfully fragrant. First, lightly salt and put the water on to boil for the rice. Then, roughly slice the chillis and finely chop the coriander. Set a little aside to garnish at the end. Pour the coconut milk and water into a blender then throw in the chillies, turmeric, chopped coriander, pepper, ground coriander, ground cumin, lime juice and fish sauce and blend until smooth. Slice the onions and garlic, then peel and slice the ginger into matchsticks and fry these together for 6-7 minutes, until golden at the edges. Pour in the chilli coconut sauce and simmer for 10 minutes. Put the rice on to boil and reduce the chilli coconut sauce for five minutes before adding the prawns and cook for a further five minutes. Drain the rice then serve immediately, garnishing with the reserved chopped coriander. This looks fantastic - I agree, coriander, chilli and coconut milk make such a great combo! Yum yum! I think they must be one of my favourite combinations - I just realised that this is the third such recipe I've blogged which contains those ingredients. Oops.